Awesome outdoor storage solution for your kayaks and SUPs! Great look for lakes, camps, marinas, etc. Pick from three finishes or finish it yourself! Superior outdoor storage for your watercraft: Outdoor storage for your SUPs, kayaks and/or canoes has never looked so good. 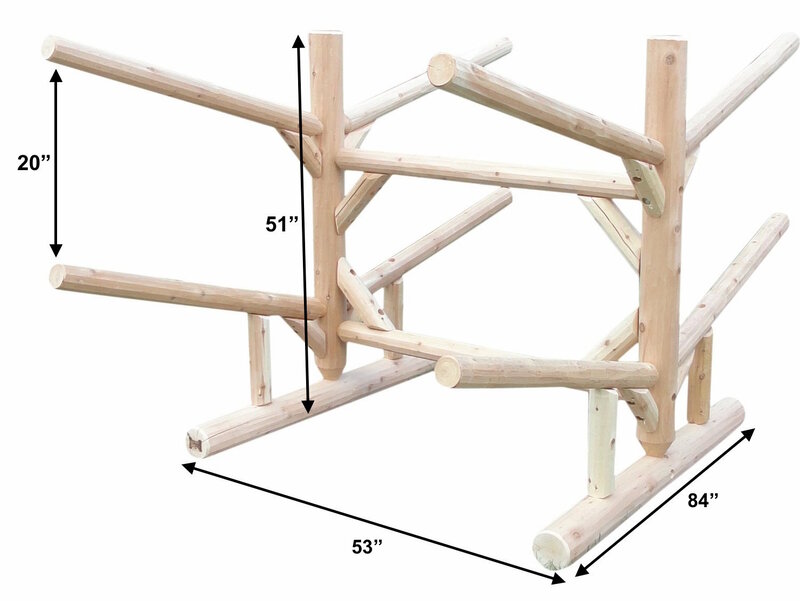 A perfect addition to a lake, camp, marina, or any outdoor watercraft spot, the Log Kayak Rack's American wooden construction is timeless, rustic, and built to last, holding even the heaviest of watercraft. Handmade from White Cedar in the U.S.A. Every Log Kayak Rack is handmade in the USA from Northern American White Cedar from Michigan. Rated for superior weather-resistance, the wood is strong, long-lasting, and can be customized with a unique finish. Each vertical post and foot of the rack is 4 and 5/8 inches in diameter and each arm is 3 inches in diameter, capable of supporting up to the heaviest of canoes. To increase your rack's longevity we suggest you set it on landscaping blocks or something similar as opposed to placing it directly on the ground. Available in three finishes: Three finish options are available from StoreYourBoard.com - unfinished, natural, and canyon brown (see the pictures above) - or you can finish it yourself at home! A finish will add to the longevity of your rack by protecting it from elements and the occasional insect or wildlife. What kind of watercraft will it hold? The Log Kayak Rack's solid wood construction gives it the strength to hold everything from a SUP to a heavier canoe. The rack arms are 8 feet apart so your watercraft needs to be that long to sit in the rack. Its widely spaced arms make it easy to take kayaks in and out, and locking mechanisms integrate nicely as well because you can wrap them around fixed pieces of the rack like the horizontal crossbars and vertical supports. You can check out one of our best-selling SUP locks here. If you're looking for a lock for your kayak take a look at one of our most popular kayak locks here! How do I assemble the rack? Assembly of the rack takes about an hour, and with the detailed included instructions is a breeze. All the racks have similar assembly instructions and there is a video on our website that shows you what to do. What can I expect as far as shipping? Each rack is custom made with the highest degree of craftsmanship, therefore you can expect yours to ship in about two weeks, adding a few days for the rack's travels! Returning this item: Please be aware that this is a Special Oversized Item and is subject to restocking fees up to 20%. For more information visit our Return Policy Page. Looking for something bigger or smaller? Check out the 2 kayak rack, the 6 kayak rack, or the 8 kayak rack! The area we want to store the rack is on a very slight hill. There would be about a 6 inch drop from one end of the rack to the other. Would you recommend this rack for our needs? We have 2 SUPs and 2 Canoes. Our log SUP/Kayak rack would work well for 2 SUPs and 2 canoes; it can support a lot of weight on each arm and holds kayaks and canoes well. We also believe it could work for your incline, if you dig the legs on the uphill side into the ground a couple inches. As a note, it is generally recommended by the manufacturer of these log stands to consider placing them them on landscaping blocks or pavers, so that they are not in direct contact with the ground. While that is not required, you could alternately consider whether there was any blocks or pavers you could use in that spot, to level the surface somewhat. Is there a warranty on this item and is it meant to be out side all year long i live in Michigan? Yes, there is a standard one (1) year manufacturer's warranty, for this line of log board & boat racks; it covers defects in materials and workmanship. And they are intended for use outdoors, year round, including in your area. To ensure its longevity, it is recommend that the feet are not in direct contact with the ground, but rather raised and set on landscaping block or a similar product. Additionally, either ordering it with one of the available stain (an upgrade), or ordering it unfinished and staining it yourself will help extend the life of the rack, though it is best to let the wood age a bit prior to finishing it. This helps the stain to soak in. You can also choose to leave it unfinished. In this case, it will weather to a gray color and still last for many years. Does it have a sealant on it? Like a polyurethane finish? These cedar log racks are available either unfinished (with no stain of any sort), or in either of two stain finishes, natural or canyon brown. Structurally, cedar logs are chosen for use outdoors because they are very strong, can stand up to extreme weather conditions year-round and look good. To ensure their longevity, we recommend that the feet are not placed in direct contact with the ground, but rather raised and set on landscaping block or a similar product. Then, as noted above, you can order it with a finish (upgrade) or you can finish it yourself. So if one decides to stain it themselves, we recommend using a stain or outdoor finish in the color of your choice, and to follow the instructions on the can -- noting that breathable finishes will extend the life of the rack the most. Also, it is best to let the wood age a bit prior to finishing it. This helps the stain to soak in. However, you can also choose to leave it unfinished. In this case, it will weather to a gray color and still last for many years. I purchased this wooden storage rack specifically because we live on the saltwater and thought that wood would be the way to go because of corrosion. My son and my husband put it together fairly easily and they are not that handy. We placed it on pavers and will let it go through the winter before we put a stain on it. Looks great! No issue with the delivery and the assembly was completed with my grandson within an hour. All the parts (including glue) were included. We didn't attach the upper arms as the loading and unloading of our hobie mirage revolution 13s would be more of an effort as we prefer to store them upside down. Its easier to load them right side up first and then flip them upside down. The upper arm would prevent the flipping as there is not enough clearance. It looks very nice and blends in with the surroundings. Very happy with the product! Shipped promptly, easy to assemble. Weighs too much for one person to carry, need two. When loaded with 2 kayaks on the bottom and two SUPs on top, high wind (25 mph) blew off one of SUPs so need to tie them down. Love the rack and extremely impressed with the packaging and the instructions! All pieces were clearly labeled from the logs/posts to screws to drill bits and glue. The only way it could have been any simpler is if the rack shipped completely fabricated. Currently have two singles and a tandem stored on it - perfect. Easy to read instructions, and a online video made the instructions that much easier. Top quality product. Spot on. Usually when you order a product that requires "some assembly " it is a nightmare. Directions were impeccable and easy to follow. Kudos to you and your company! Great addition to our lake home. Super easy to set up and install, looks great in the yard, I would buy more. Just purchased this and put it together in about 20 minutes. So far so good!